THE Mall del Sur, a new $200m shopping centre at the gateway to Lima’s sprawling southern shantytowns, is crowded on Good Friday morning, even though its two anchor department stores are not yet operating. Among the sightseers are Henry Salgado and Olga Falcón. He is a theatre photographer; she ran a small catering business that folded. They plan to vote for Keiko Fujimori in Peru’s election on April 10th. The two friends, both aged 42, remember the 1990s, when Ms Fujimori’s father, Alberto Fujimori, ruling as an autocrat, vanquished the Shining Path terrorist group and hyperinflation. He set Peru on a path of 25 years of rapid economic growth before his regime collapsed amid systematic corruption and electoral fraud. “It’s true that he got corrupt at the end,” admits Mr Salgado. “But all this began then,” he says, referring to the mall. Ms Falcón worked in a hotel in Spain for ten years. Now she sees opportunities in Peru. The country has enjoyed a remarkable growth spurt. Income per person rose at an annual average rate of 3% between 1990 and 2013, compared with 1.7% for Latin America as a whole, according to the World Bank. In 2001, 54.7% of Peruvians were poor; by 2014 that figure had fallen to 22.7%, according to the UN. 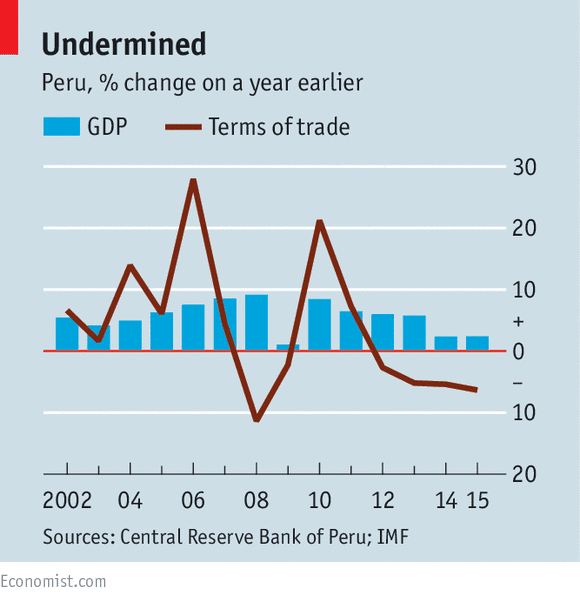 In this century, the economy was boosted by high prices for Peru’s minerals. It has also been underpinned by a political consensus in favour of a market economy run by technocrats. That consensus survived the election in 2011 of Ollanta Humala, a former army officer, who initially ran on a leftist platform. Almost uniquely in South America, Peru saved part of the gains from the commodity upswing: Luis Carranza, a former finance minister, points out that net public debt fell from 37% of GDP in 2000 to just 3.6% in 2014. Now the mining boom is over and growth per person has dropped, to less than 2% last year. Much of that comes from the opening of big new copper mines. With metals prices much lower, their impact on the domestic economy is limited: private-sector formal jobs are expanding at only 1% a year. The task facing the new government is to sustain growth and social progress in a less favourable climate. That means tackling the many inefficiencies that hold Peru back. The conduct of the election may make the next president’s job harder. The electoral tribunal has undermined the legitimacy of the eventual winner by disqualifying one of the strongest candidates (see chart). After initial stumbles, Mr Humala’s government started to correct some of the economy’s underlying problems. It is trying to support diversification with technology centres, industrial parks and the cutting of some needless regulation. It has stepped up (still low) spending on health and education and subjected teachers to evaluation. It has begun a reform of the civil service and has expanded and professionalised social programmes. Still pending are some politically contentious or complex reforms. Top of the list is the labour market: the law bars employers from sacking most workers, thus deterring hiring and condemning 70% of Peruvians to ill-paid, insecure jobs in the informal sector. Alonso Segura, the finance minister, says that devolution needs to be rethought. Regional and local governments now get more than half the resources for public investment but are often slow to spend the money. He adds that a bigger effort is needed to cut red tape. Public investment should be steered away from big-budget projects, such as a gas pipeline to the Chilean border, and towards improving transport and internet connections and public services, argues Alberto Rodríguez of the World Bank. There are no direct flights between Arequipa, the second city, and Trujillo, the third. 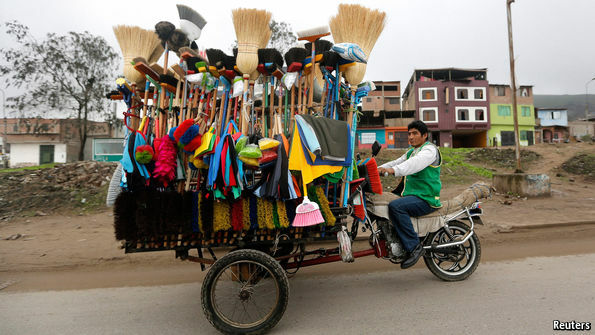 Lima, the capital, has become an inefficient monster. Mr Humala did nothing to gain consent for several big mining projects stalled by local opposition. Another challenge involves water: more than 60% of the population lives on the Pacific coast, which is a desert. Crime has become rampant on Mr Humala’s watch, unimpeded by a corrupt police force and by seven interior ministers in five years. His lack of political skill meant that he lost control of Congress. And corruption allegations swirl around his ambitious wife, Nadine Heredia (who denies wrongdoing). Under the constitution, Mr Humala cannot run again. His approval rating is around 15%. That opprobrium highlights Peru’s biggest weakness: the near-total absence of genuine political parties, which is both a symptom and a cause of the cynicism Peruvians express towards their leaders. It is also a big factor in the unpredictability of the country’s elections, exacerbated this year by the arbitrary and nitpicking application of the law by Peru’s electoral authority. After a campaign marred by the disqualification of Julio Guzmán, a centrist development consultant, and another candidate, the opinion polls suggest that Ms Fujimori will take a strong lead into a run-off ballot on June 5th. She promises continuity in economic policy but has been cagey about reforms. Her likeliest rival is Verónika Mendoza for the left-wing Broad Front, who wants “profound changes” in economic policy and a new constitution. Aged 35 and a congresswoman, she was close both to Hugo Chávez’s regime in Venezuela and to Ms Heredia before breaking with the Humala government. A relaxed and articulate campaigner who speaks fluent Quechua, the main Amerindian language, she is the clearest beneficiary of the exclusion of Mr Guzmán. 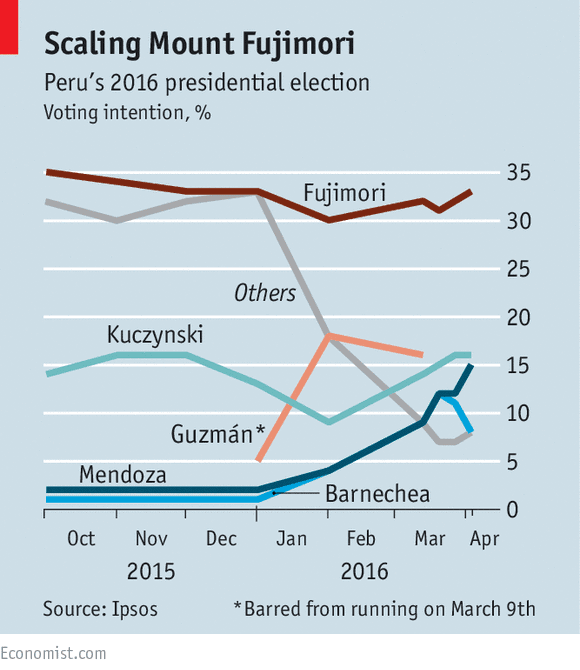 The polls suggest she is poised to overtake Pedro Pablo Kuczynski, a former economy minister. He is honest, liberal and has the best-qualified team of advisers. But he has handicaps: he is 77, and a former investment banker who struggles to connect with ordinary Peruvians. Two issues have dominated the campaign. The first is anger at the political establishment. That is why Mr Guzmán surged past Mr Kuczynski in the polls and support for Alan García and Alejandro Toledo, both former presidents, plummeted. The desire for change is now benefiting Ms Mendoza and, to a lesser extent, Alfredo Barnechea, a journalist and consultant campaigning as a European-style social democrat. Second, there is the battle between Ms Fujimori and “anti-Fujimorismo”, the issue that will dominate the run-off ballot. Her father continues to be revered by around 20% of Peruvians. Many poor people recall fondly that he travelled around the country opening schools and health clinics. But a larger number of Peruvians abhor him for having shut down Congress in a “self-coup” in 1992, for his human-rights abuses and for the unprecedented corruption of his regime, for which he is serving jail sentences. Ms Fujimori, aged 40 and educated in the United States, lost narrowly to Mr Humala in 2011. Since then she has expanded her political base and edged towards the centre. She has dumped some of her father’s aides and admits that he made “several political mistakes”. According to Martín Tanaka, a political scientist at Lima’s Catholic University, “she promises efficiency and order, and is a symbol [of Fujimorismo] with a friendlier and more reasonable face” than her father. In any event, her party, Popular Force, looks likely to win almost half the seats in Congress. But will all this be enough for Ms Fujimori to win the presidency? She is in a much stronger position than five years ago. Her rival, Ms Mendoza, shows no desire to make the move from left to centre that brought Mr Humala victory, although she says she would not copychavista Venezuela. 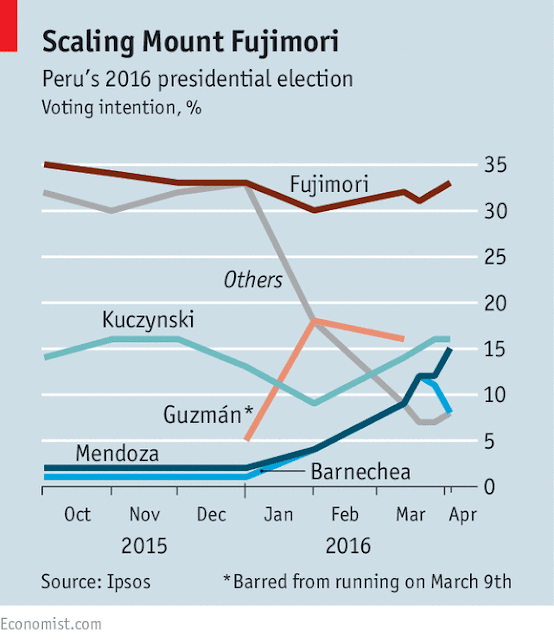 Should Mr Kuczynski make it onto the June ballot, he would have a better chance of uniting the anti-Fujimori vote. It is symptomatic of Peru’s political weakness that its most powerful ideological current is a purely negative one. Ms Fujimori’s critics worry that her victory would retroactively legitimise her father’s abuses against democracy. Around 30,000 joined a protest march on April 5th to mark the anniversary of Mr Fujimori’s shutdown of Congress. “I think she’s a democrat,” Mr Tanaka says of Ms Fujimori, “but it’s true that she leads a movement where many are not convinced democrats.” In a campaign debate on April 3rd Ms Fujimori unveiled and signed a one-page document in which she promised “unrestricted respect for democracy and human rights”, and declared she would never seek to change the constitution to stay in power or repeat the “self-coup”. Unless Mr Kuczynski clings on to second place, Peru faces a battle between the heir to its most controversial president of the 20th century and a neo-chavista. And it will elect its first woman president. Whether it will get the reformist government it needs to sustain its progress is less clear. It was August 2014 and Novo Banco had just been created from the ashes of Banco Espírito Santo, Portugal’s failed lender. With its toxic assets relegated to a bad bank, all that was needed was an image — something to capture the spirit of a new era. A phoenix might have worked, but Novo Banco tried something else: a green butterfly perched amid black and green letters. The wings “symbolised the first season of transformation and renewability”. But the green butterfly never quite took off as an idea, and was ditched before it made its way into the bank’s later promotional materials. The sense of optimism soon faded too. At the end of December last year, five of Novo Banco’s bonds were wiped out. Institutional funds, including Pimco, were furious after their investments were transferred to the “bad bank”. The decision, made by the Portuguese central bank, improved Novo Banco’s capital position but it rattled markets. The Novo Banco episode reflected a shift in the political mood in Portugal after years of austerity imposed by a three-year bailout programme. But it also reflected a new, much broader regulatory regime in Europe, intended to make bondholders — not taxpayers — liable when banks run into trouble. The Novo Banco drama, which came just before new rules for bank failure from Brussels, set the tone for a difficult period for European banks. As global markets endured a tumultuous start to the year, scrutiny of the sector intensified. Italian bank shares hit record lows over bad loan fears. By early February, prices for the riskiest bank debt traded at distressed levels. Even senior debt, one of the safest ways to invest in banks, dropped sharply. No bank had failed, but markets were behaving as if a crisis was in the offing. The chaos across markets has subsided and prices have recovered, but its implications have echoed at the very highest level. When the European Central Bank announced further rate cuts earlier this month, its president Mario Draghi said the new measures, in particular cheap financing for eurozone lenders, came “in an environment where the pricing of bank debt is volatile and uncertain”. Though the market movements were blamed on a long list of factors, bank analysts kept returning to the seemingly isolated case of Novo Banco. Investors began to examine the way losses had been imposed and look for clues in a strange new universe of bank debt. One of the least discussed aspects of the financial crisis was the impact, or lack thereof, on investors who held bank bonds. When the crisis struck, some of the safest bank bonds, known as “senior unsecured”, went mostly unscathed. Now regulators have changed that equation, placing bondholders on the hook in the hope that banks can be made safer without public money. This means that bank debt — once far safer than many other types of corporate bonds — will become riskier. One emblem for this new regulatory philosophy is the coco bond. Engineered since the crisis and designed to transfer risk to sophisticated investors, contingent convertible bonds, now more commonly known as “additional tier 1” (AT1) capital, convert to equity or are written down when a bank’s capital falls below a certain level. In other words, when the bank loses money or its assets collapse in value, the bondholders lose money as well. This new kind of debt is part of a broader category referred to as “bank capital” — equity and equity-like debt loosely analogous to a deposit on a house. Banks issue these capital bonds to meet regulatory requirements, which demand more capital to make the system safer. When banks run into trouble, this capital is in the line of fire. As the spectre of negative interest rates came to the fore this year — a result of central bank policies designed to boost lending — bank equities and capital bonds fell dramatically. In the first half of February, the index for coco debt fell nearly 8 per cent. A €1.75bn Deutsche Bank bond traded at close to 70 cents on the euro. After the coco sell-off, it became clear that markets for different kinds of bank bonds were deeply interconnected. Analysts at JPMorgan Chase warned that coco markets had become a “conduit for channelling bank equity stress into the broader credit market”. More worryingly, markets for bank funding — part of the fuel for loans — briefly closed down. At the March press conference, Mr Draghi said European banks “face sizeable forthcoming funding needs”. In Basel on a brisk November day last year, Mark Carney was sitting in a room with half a dozen reporters. The governor of the Bank of England and head of the Financial Stability Board was announcing the latest step in the post-crisis regulatory drive. Senior bonds — that portion of debt which is not “bank capital” — were about to get riskier. These rules for “total loss-absorbing capacity”, or TLAC, followed the ideology of transferring risk from governments to markets. They were intended for the biggest global banks and came alongside a separate European directive on loss-absorbing bonds. Regulators, seeking to correct what was seen as the perverse immunity bank bondholders enjoyed in the crisis, required senior bank bonds to become “bail-inable” — meaning they would take losses when banks failed. Banks deemed “systemically important” would also need a certain amount of this debt to make sure there was enough of a cushion to absorb losses in a crisis. Bank bonds account for more than 30 per cent of all debt securities, more than twice as much as non-financial corporate debt. Different parts of the world had different approaches to meeting the requirements. In Germany, the law was changed. In the US and the UK, banks sold bonds out of their holding companies. Some of the characteristics of post-crisis “bank capital” bonds had been applied to a much bigger market. In the words of one investor, nearly all bank debt had now become coco-like — something engineered by regulators to take losses, albeit after a failure. Everything looked more like a coco, but what did coco bonds look like? One of the biggest problems for investors is the ongoing changes to rules. In December, such uncertainty hit the coco market, when the European Banking Authority, a regulatory body, had stated an “opinion” on the market which seemed to imply interest payments on the bonds might be stopped sooner than expected. This regulatory confusion was linked to the sell-off. In February, the market suddenly looked dangerously complicated. Hedge fund managers theorised over whether bonds would eventually be bought back. In Switzerland, the price of a host of bonds that had become defunct late last year fell sharply and counter-intuitively. The AT1 market in Europe stands at close to €100bn. The market for senior unsecured debt of the biggest banks globally was €4.26tn at the end of 2014, according to estimates by the FSB. Mr Podobnik points out that these new rules reduce leverage and thereby make the banking sector safer. But he points, also, to this difference in scale. “We are in a new world where the risk profile of bank instruments generally has changed,” he says. Even without a Titanic moment, these accumulated changes have an impact. Banks are braced to pay more to borrow from the markets, potentially adding costs to the loans they make to households and businesses. The struggle to price risk is linked to uncertainty. Many analysts suggest one of the biggest sources of uncertainty is the regulations themselves. A bigger test will come when a bank actually fails. The vital question then will be whether the shake-up in the structure of bank bonds will work. Novo Banco was not technically a failure, but the political complications that emerged were not encouraging. Novo Banco’s logo never took off, but it now looks almost prophetic. The whole affair has more than a hint of the butterfly effect about it. Born in 2014 out of the country’s biggest banking failure, Novo Banco has become a test case for Portugal’s capacity to rebuild lenders out of the destruction wrought by the global financial crisis. For many, the collapse of its forerunner, Banco Espírito Santo, and the family business empire of the same name, marked a blow against “crony capitalism”. The “anti-austerity” Socialist government that took office in November also claims that the case illustrates how the previous centre-right administration — and, by implication, the EU, International Monetary Fund and European Central Bank — failed to deal with the problems facing Portuguese banking during a gruelling three-year bailout of the country from 2011 to 2014. BES imploded only months after Lisbon celebrated its “clean exit” from the adjustment programme, having used only about half of the €12bn that had been earmarked for banks out of a €78bn bailout. According to the new government and its far left allies, the exit was achieved only by sweeping problems in the banking sector “under the carpet”. After injecting €4.9bn into Novo Banco through the bank resolution fund, which is owned by all of Portugal’s banks, lenders are expected to sustain losses from its planned sale, which some analysts see as unlikely to raise much more than €1.5bn. In December, the new government set aside another €2.2bn to rescue a small Madeira-based bank. “Portugal has to turn the page on the instability of our financial system,” said António Costa, the prime minister, this month. He also distanced himself from the Bank of Portugal’s decision to impose losses of almost €2bn on some Novo Banco senior bonds. Criticism of Carlos Costa, the central bank governor (left), has been condemned by the centre-right opposition as an attempt to force him to resign. For those with strong stomachs, things seem dicey if nothing else. There’s no question investors are seeking answers to what’s happening, and why. To that end here’s a monthly chart of the S&P 500 which remains the top index to measure markets in my opinion. Then, of course are the fundamental views. There is the coming of weak earnings for the coming quarter. Of course experiences from these events are bolstered by, you guessed it, earnings beating analyst’s expectations. Recently the has led to rallies since that’s been the market’s mojo Companies have also used ultra-low interest rates to borrow money at cheap interest rates to incur massive debt, and with it purchase shares in the open market. These buybacks have the benefit of reducing shares making even lower earnings better over fewer shares. This activity has bolstered stock prices benefit all holders and especially to insiders with lucrative stock options. This action has a short-term benefit to companies but robs future growth since it doesn’t fund capital investing in research and the like. Thursday markets are now concerned about weakening Global Growth. That borders on amusing since who didn’t know this concern didn’t exist? Employment on the surface has been good but inside the numbers only the lowest paying jobs have been present including part-time jobs and hamburger flippers. Not to denigrate those on government entitlements, it’s been more beneficial to receive these benefits than work. Inflation? There hasn’t been any, and any vies of energy prices confirms this. Just as investors were feeling good about the rebound Wednesday in stocks, their good feeling were dashed Thursday. As it’s been common over much of 2016, bulls have been seeing opening market declines being quickly bought by dip-buyers. I believe these buyers are defending their misbegotten positions. They could include overseas sovereign wealth funds (some backscratching among central banks), hedge funds, large portfolio managers and so forth. The Fed with interest rates at near zero, along with of central banks, have run out of ammunition if should economies shrink to unacceptable or recessionary levels. They really can’t lower interest rates any further. Negative interest rates anyone? Volume picked up on selling which is par for the course and breadth per the WSJ was the reverse of Wednesday. My last remarks focus on the early comments especially regarding the monthly S&P 500. Not only does it appear to make conditions shaky, the fantasy that’s been supporting higher equity prices seems to be over. Further consistently deteriorating economic conditions and earnings reports lend nothing to bullish sentiment. I may not post Friday. If not, enjoy your weekend.